Despite being effective a few years ago, not all SEO strategies remain as good today due to the changes in Google ranking protocols. The multiple domain strategy is somewhere in the middle. It’s very important to understand the pros and cons of this technique in order to decide whether it’s right for your business. Sending out more personalized messages. Businesses with products that appeal to a wide range of audiences will benefit from having multiple websites, because they can customize them to target different groups. For example, a company selling time management optimization software will need to use different approaches when targeting college students and business owners. It’s possible to create a message that will fit both parties, but creating two highly specific websites will boost the campaign’s overall efficiency. Niche websites to give your product/service a more diverse representation online. Quite often having one big website loses out to having several niche websites all linking back to your main site. This approach allows covering multiple topics thoroughly. It’ll also be a benefit when using shared servers. 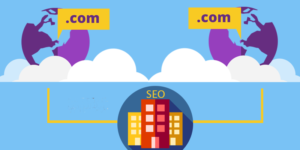 Note that using a multiple domain strategy means you’ll need to be very picky and select a provider optimized for multiple website hosting. Localized websites for multiple countries. If you are running a global business, it might be more efficient to have a separate website for each country. This way you will be able to not only translate its content but to localize design. This infographic from HubSpot illustrates the efficiency of local SEO and marketing very well. Not many benefits for SEO overall. If boosting SEO is your main goal, link building benefits from using multiple websites won’t amount to much. In fact, if you duplicate your content on those ‘secondary’ websites, you can harm your ranking. Never forget that originality is paramount for good SEO. Sometimes it might be difficult for a customer to actually find you if they keep bouncing around through links on secondary websites. For this plan to work, you need to design the pages and links very efficiently so that you won’t lose people who get frustrated because they can’t reach the page they really need. Difficulties with building up brand identity. If you choose to disperse your product catalog among several websites it might be difficult to build your brand. Customers will be focusing on individual products instead of your actual business. To prevent this you need to put your brand first in all your marketing campaigns. For a multiple domain strategy to work well, each of your websites must be filled with high quality original content. This will increase your costs as well as require more time for managing the websites, so you’ll need to hire extra staff. Using multiple websites can be good for some businesses. However, it’s not a ‘one size fits all’ kind of strategy. In order to benefit from it, you need to invest a lot of effort and a good deal of money into developing several good and original websites that will promote your brand from different angles.